In Celestia (Amazon, BGG), you and your crew of adventures are aboard an aircraft traveling through the cloud cities of Celestia. Your goal is to collect the treasures from each city which grow in grandeur the further you travel. The group is a discordant bunch and you were unable to choose just one person to be in charge so you will each take turns being captain. It won’t be an easy journey. You will be hampered by fog, lightning, birds, pirates, and, probably, each other. But if you play your cards right and push your luck just far enough, you will fly away as the richest of your crew. 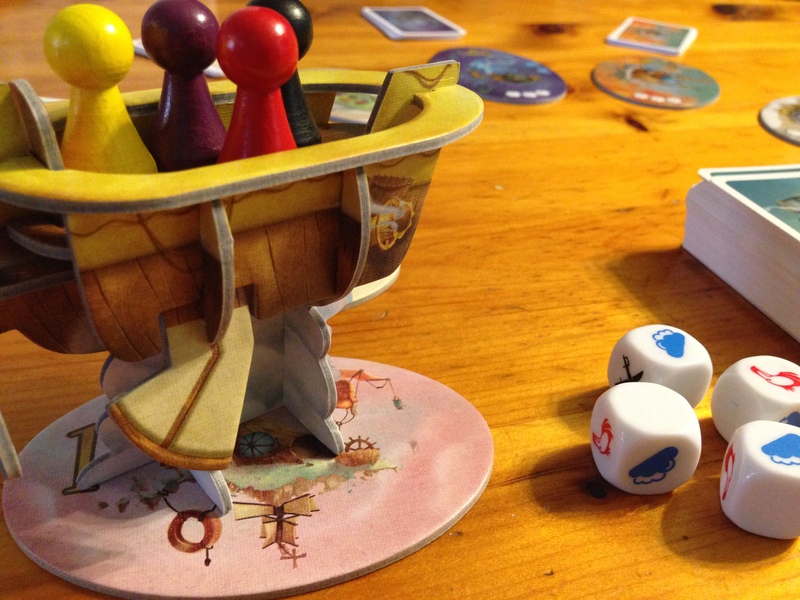 The game begins with all the players placing their pawns in the three dimensional cardboard airship. Each of the nine cities are set up from lowest to highest with the airship placed at the lowest city. Treasure cards are placed next to their corresponding city. Each player gets six-eight cards and the first captain is chosen. The captain rolls two to four dice (depending upon the next city up from where the airship is docked) to determine what difficulties the crew will face. Then the rest of the crew determine (clockwise from the captain) whether they wish to get off at their current city (I will leave) or to stay in the ship to travel to the next city (I will stay) and more precious cargo. Any crew who decide to disembark will remove their pawn from the ship and take a treasure card from the city’s deck. The worth of the treasure card varies at each location and increases the further you travel (although some special items can only be had at the earliest cities). After the crew is done at the current location, the captain plays the cards needed to overcome the obstacles. If the captain is successful, the remaining crew in the ship move forward and the player to the left becomes the new captain. This continues until a captain is unable to overcome the obstacles in their way, the ship crashes, everyone starts at the beginning, and draws up one equipment card. 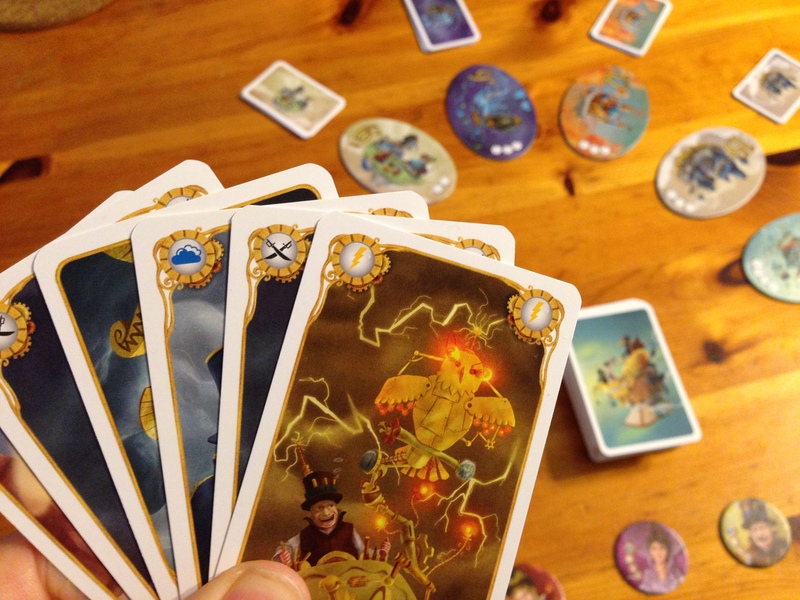 This is a retheme of Cloud 9 (1999) and maintains the light, interactive push-your-luck mechanic of the original with much upgraded art and components. The decisions and card play are simple so this is a great filler or ender. Basically, if you are the captain, only you know if you can overcome the difficulties so you need to bluff the other players to either stay on board or get off as quickly as possible. If you are the crew you need to read these bluffs and disembark at the right time or play the right cards to influence the result. Some cards can do more than just avoid hazards, these cards have additional powers such as a Turbo Card which acts as a wild card to overcome any hazard, a Jetpack which lets someone jump off right before the ship crashes, some allow for rerolls, others force players off the ship. Celestia’s strength lies within it’s simplicity and its beauty — it is cute and colorful but not glaring. It is quick to set-up, simple to learn, and provides just enough interaction and take-that to make it interesting without getting too mean. The artwork and production quality are both wonderful — it has a nice, gentle, “around the world in 80 days,” whimsical, steam-punk vibe to it that isn’t too over-the-top or off putting. It plays best at higher player counts and still comes in at 30 minutes with 6 people playing. This game encourages surprises, bluffing, and explosive moments of laughter (when certain cards are played). 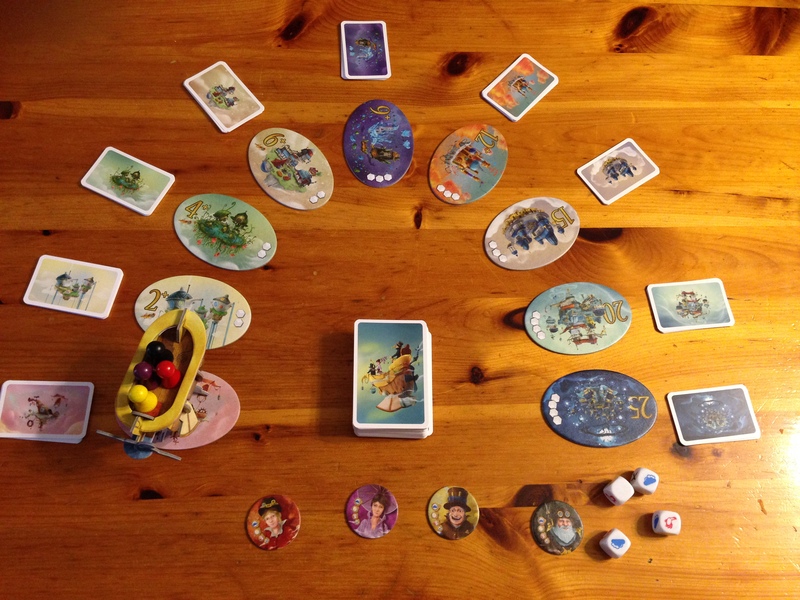 While most press-your-luck games tend towards the abstract (King of Tokyo notwithstanding), Celestia does a great job with theming such a simple game. Player interaction isn’t intense and even being booted off the ship still allows you to pick up a treasure. There is also a surprising amount of table talk. The crew will berate the captain and the captain will bluster or sweat to bluff out the crew. It allows for plenty of supplemental interaction which doesn’t necessarily pertain to the game but certainly adds to the experience. A quick break on the reviews to design a new game and polish up an existing prototype.